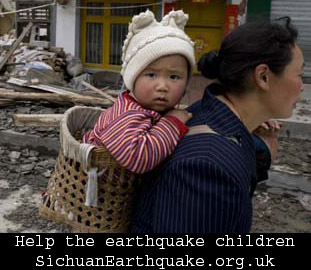 Sichuan Earthquake Update is a jointed effort by UK charity Mother’s Bridge of Love (MBL), Chinese community LinkChinese UK, Chinese Young Professionals in Edinburgh (CYPE), and other organisations to update the news of Sichuan Earthquake, the progress of the relief and rebuilding efforts. Our focus is on the children affected by the disaster. The effect of the earthquake is terrible. The scenes of hundreds, perhaps thousands of students buried under the debris are heart-breaking. For those children who have survived, they will have a mountain to climb trying to rebuid their life. We are sending this urgent call to British public to do whatever you can to help those children. At the moment, the easiest way to give your help is to give your donation to MBL, who will us their expertise and network in China to identify and reach those children who most need help to recover from the truama and to go back to school as soon as possible. A donation page has been created on justgiving website. You are also welcome to contact MBL directly (headoffice@motherbridge.org 020 70340686).